"I hear that Antoine took a DNA test. Does that mean he found his parents?" "He did take the test but we...or he hasn't gotten the results back yet." "What about you, Aili? Any word on finding your mom or any hints as to where she might be?" "See that man over there that Antoine is talking to?" "Yeah. What about him?" Wait....are you saying he's your..."
"No. 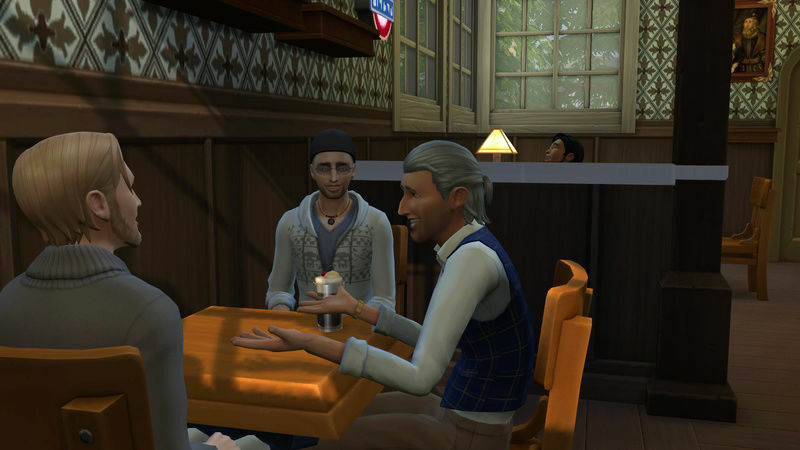 Not any relation to me, but he claims that my mom married a guy, some rich dude, and they were living in San Myshuno." "So have you gone to the city in search of her?" "No. I did some searching but there is no current record of my mother, Victoria Willow or her husband, Nelson." "Shut up! Are you serious?" "Your mom is Lady Victoria Willow?" "So that old guy says. I don't know for sure because I can't find her." "I'll ask around for you if you like?" "No Jer. I can't ask you to get anymore involved in our mess than you already are. You've done so much for us, already." "Aw, no problem, Aili. I'm just glad we met when we did and I could help you stay out of that orphanage." "Oh! They are shutting down the place!" "What? What about all the other children?" "The city, along with several social workers and the President, were able to find homes for all the kids there." "And what about Mother Harriette?" "She's going away for a long time. Turns out some dude who claims he found his son who was stolen from him is making sure that she goes away for eternity." "Oh. I've got to talk to Antoine." "Yeah. I've got to be going anyway. Tell him I said hey." "I will, Jer. And thanks again for everything you've done for us." "Just do me one favor, Aili." "Invite me to the wedding and name your first kid after me?" "Oh Jeremy, you're too funny." "Oh I'm dead serious, Aili. I see you two getting hitched right after your birthdays and maybe if not before, a little Aili and Antoine coming shortly after." "Bye, Aili. See ya around." "So anyway, Paul. We may have found our young Antoine. Been right here under our noses the whole time." "Well I'll be jiggered. I remember something about your daughter and her boyfriend having a child and him going missing. I just figured they had given him up or something else had happened and your family didn't want to make a big deal out of it." "She hurt for a long time after. She kept saying her baby was alive, when the police closed the case." "So, Antoine. How do you feel about all this? Must be quite a shock." "Well, we don't know for sure if I am Jaques grandson or missing grandson or however you want to put it. I just did the test the other day and I'm really not holding much faith." "I understand. But listen son. A little word of advice?" "If it turns out you are, Jaques grandson, give them a chance. What happened to you wasn't because your mom and dad didn't want you. They did look for you but that old lady at the orphanage was able to cover her tracks pretty good. She was a con and darn good at it and she was not working alone. 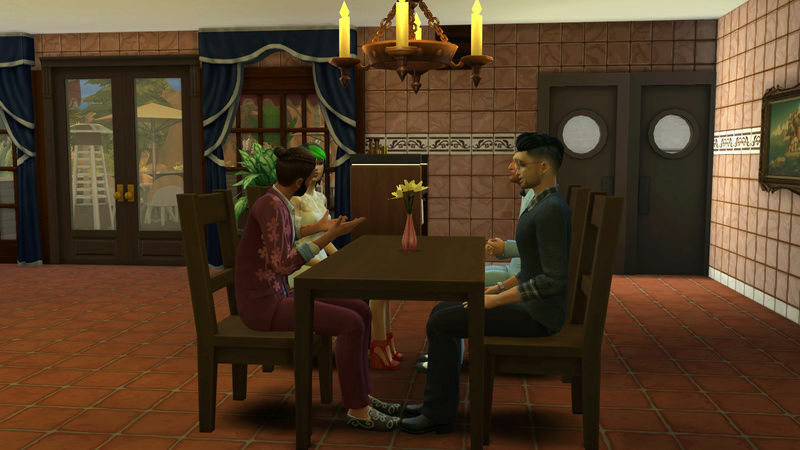 So cut Jaques and your dad a break and give them a chance to get to know you and you to know them. I promise you won't be sorry. They are a decent family, loving and caring. You won't have to worry another day for the rest of your life." "Sure. Okay, Paul. I'll think about it." "Make sure you do that or you will be sorry." "So now that it is official. What do you say we all go and have a celebratory dinner?" "I'm game. How about Antoine? Son?" "Will your young girlfriend be joining us?" "Well go ask her son! Hurry on now." "So Aili. Are you going to make an honest man out of my son here? Or will it be the other way around?" "Please. Call me dad. It'll make it less confusing for everyone." "How about you call me Antoine and I'll call you Mr....What is your last name anyway?" "Last name is Creed but please call me dad." "I feel more comfortable calling you Mr. Creed for now." "Okay, okay. I did promise not to ask anything of you. I'm just so happy that I finally know you are okay." "Mr. Creed. Aili and I haven't made any plans on anything in the future yet. We just promised to be there for each other for forever. You know like what best friends do." "Ah huh. Are you sure about that? Is that what you both want? Aili? Antoine?" "Yes Mr. Creed...I mean sir. Antoine and I are just best friends." "Well. I see more than just best friends in your eyes. The way you two look at each other. Reminds me of your mother and I, Antoine. There's more than just friendship behind your eyes." "Don't know what your talking about, sir. Aili and I have grown up together. We are practically brother and sister." "You can't fool these old eyes. You two are meant for each other. And Aili..."
"You will make a fine addition to our family." "Thanks for dinner, Mr. Creed." "Please, Antoine. I really hope you will one day, call me dad." "Can I at least give you a hug? Son? Please?" "Yeah. I guess it can't hurt." "Your mother would be so proud of you. You have become an outstanding young man." "Like I said. An outstanding young man." "What about my mom? You and Jaques keep talking like she's..."
"She is no longer with us, son. I'll tell you all about her one day." "Oh Antoine! I'm so happy for you!" "Because you found your dad and granddad! Silly!" "Yeah. They may be my dad and granddad, but mom isn't alive anymore so I don't know what the point of carrying on with those two would be." "Antoine! How can you say that! They are your family regardless if your mom was alive or not. They can still tell you all about her!" "Antoine. Please give them a chance? For me?" "Why? Why is it so important to you?" "Because we set out on this journey to find our parents. Or at least find out about them. You found your dad and your granddad. You have an opportunity that most of us orphans never get and that is to get to know your family. Your real family. Please or you might regret it one day. Like when you have your own children." "Alright. I'll give them a chance." Oh, I hope it isn't the end of their story. I could carry on with their story, but I have no idea what I would call it because they really don't qualify as runaway orphans anymore. It is something that I will think about! I'm glad that you enjoyed reading it! I'm back with some more of this story. I had decided before my graphics card crapped out that I was going to continue with the story of Aili and Antoine. Now that, that has been fixed I can continue on finally! "So this is the house your granddad said he bought for us?" "Well it kind of needs to be Aili." "There's something that I need to discuss with you Aili." "Lets go in and check out the place first before I tell you and any decisions are made." "You're really freaking me out here, Antoine." "Don't be silly. It's not bad. I think you'll agree with what my granddad has asked." "Well okay then. Lets go check this place out." "Okay. I've seen it all. This place is huge! 3 full baths and 6 bedrooms?! Wow!" "Yeah and a huge basement. Did you see the porch off the dinning room Aili?" "Yeah. Sweet! 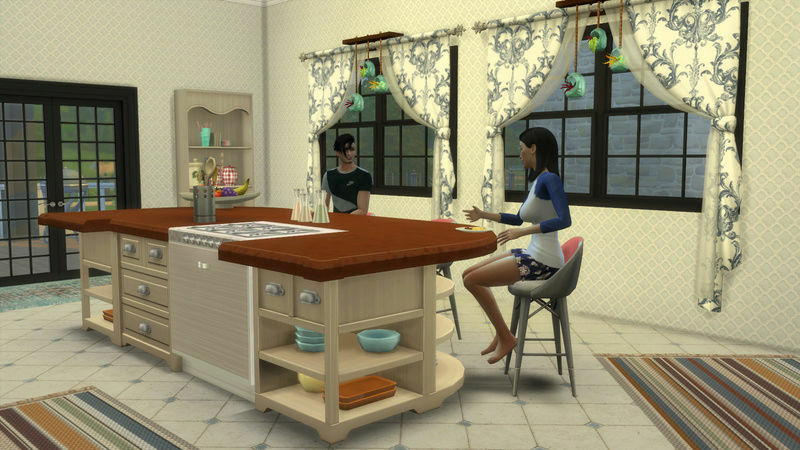 And the kitchen is awesome!" "There's a covered deck out back and the rest of the yard is pretty big. Big enough for..."
"Okay Antoine. Spill it. What are you and your grandpa up to?" "Fine. But keep an open mind. I'm all for this...and I hope you will be too." "Well there's only one way to know, Antoine. And that's for you to spill it." "Granddad got a call from all the neighboring towns, mayors. Since the orphanage was shut down there is nowhere for any of the orphaned children to go anymore. Others have opened up their homes and taken as many kids as they could but they keep getting kids that need a home..."
"OH MY GOD Antoine! Are you serious? You're grandpa wants us to be an orphanage?" "No just more like foster parents." "Whatever! I'm in! Those poor kids. When can they start moving in? Today? WAIT!" "We can't raise a bunch of kids and not be married! What kind of example would that be for some of these young impressionable minds!" "Do you want to get married, Aili?" "Well...to be honest and don't get all offended Antoine, but no I don't. Not now anyway." "Not offended at all Aili. Truth is I was hoping you would say no." "Really? You don't want to marry me anymore? You used too." "No. I mean yes. Yes I still want to marry you, but like you said, just not right now. I still love you Aili and still think you are the only girl for me." "So there's been no one else since I left?" "Actually quite a few and a lot of one night stands..."
"Stop Antoine. I get the picture. You're... well seasoned." "What about you Aili? Meet anyone while you were out wondering?" "Actually yes. We were quite serious too. Almost made it to the alter." "Oh Antoine. He was nothing like you. Actually I'm glad he called it off the day of. It wouldn't of lasted long anyway." "He liked his women and men and juice too much to be straddled to just one person." "So it looks like we are both starting over then. And with a household of kids." "Yup! I'm excited! How about you?" "If you're a part of it and my life...you bet!" "Well what are you waiting for! Call your grandpa and lets get this place hoppin!" Very happy to read more about the orphans. This is going to be interesting. Welcome back Aili and Antoine. Things are getting very exciting in the story. Thanks MW and Gram! I'm hoping to have chapter 2 up later today. "Gramps called last night, he said he will be putting more money into the "foster" account for furniture." "Okay good. I was wondering how we would manage with just your salary from the planetarium." "We'll be okay, Aili. You don't need to worry about the finances." "Seriously? Antoine? You're gonna be like that?" "I didn't mean that to sound the way it did." "Why are you in such a foul mood today? I just meant that you don't have to worry about money." "I'm not in a foul mood. At least I wasn't until you made that comment. Like I'm just suppose to be arm candy or something." "Aili...I just don't understand were you got that from. I did not mean all you are is arm candy or you know..."
"Or what? No I don't know, Antoine...why don't you tell me what I'm not!" "Geez Aili. You are not eye candy or arm candy or a f.w.b." "Come on Aili. You know darn well what f. w. b. is! Friends with benefits...because we are more than friends. You are my girlfriend and my best friend and I would never insult you or treat you as anything less than what you are. Smart, caring, level headed..."
"Okay okay Antoine. Stop groveling. I'm sorry for my moody outburst." "It's okay, no need to apologize. I should of been more carefully with my tone and words. But I have to leave for work. See ya later." "Hello. Is this Aili? Aili Morrissey?" "Yes ma'am, this is she"
"Miss Morrissey, my name is Claudia. 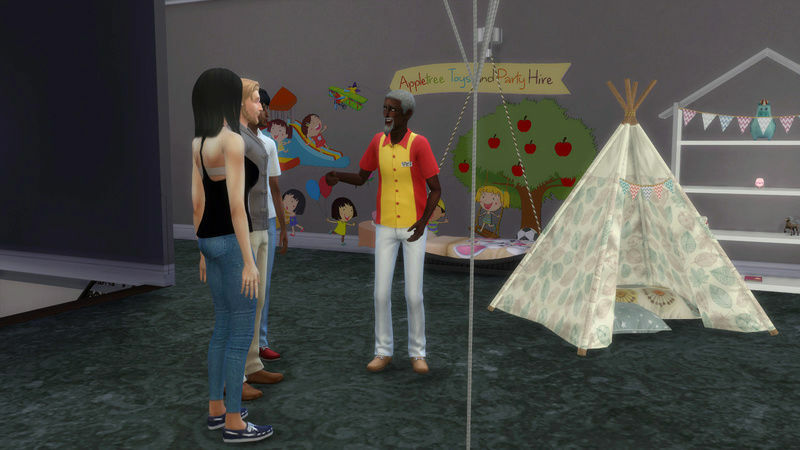 I'm from the City of San Myshuno's Child Health and Welfare division, I received word from Mayor Quinn that you and your fiance, Antoine Dukes, are willing to open up your home to orphaned children?" "Um, yes but Antoine and I aren't..."
"Aren't what, Miss Morrissey, has your relationship status changed? 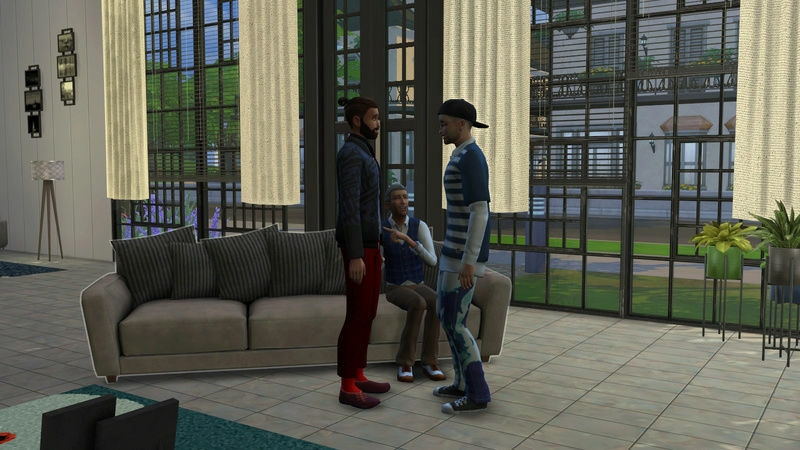 Mayor Quinn spoke to a Mr. Jaques Dukes and he assured the Mayor that your relationship with Mr. Antoine Dukes was strong. You must understand that these children need to be placed in a stable home environment." "Yes, yes I understand that, Ms... Antoine and I are fine and we can and will offer these children a stable and loving home. Is there anything else?" "Okay, Miss Aili, there is one more thing. Your first foster child is one her way there now. One of our employees will be dropping her off. Her name is Ruby Gauthier. She is 10 years old and was removed from her home due to unhealthy living conditions. Please let us know if you have any problems with Ruby as you will be the 15th foster home we have tried to put her in." "Will there be a problem with placing Ruby with you?" "No! Absolutely not! Don't you worry, Ms. Claudia, Antoine and I will be able to handle her." "I'm really glad to meet you Ruby." "Do you only speak in one word answers?" "Well good then. Is there anything you'd like to ask?" "How long are you gonna keep me"
"Ruby! Why would you ask such a sad question!?" "Because everyone else only had me around for 3 days. Then they would call the worker and say I had to go." "Ruby, hun. Lets get one thing straight. You can stay here for as long as you like. But there are rules that need to be followed." "Rule 1. Homework after school. Rule 2. If you want respect and trust, you have to earn it and you have to trust and respect Antoine and I. Rule 3. Pick up after yourself. "He is my...fiance. He is at work right now." "At the planetarium. He's training to be an astronaut." "Do you have any problems with our rules?" "Oh and one more thing you should know. You will probably have to share a bedroom. You won't be the only foster child coming here." "So we are back to the one word answers, I see." "Yes go and make yourself at home. Your bedroom is upstairs 3rd door on the right. Hope you like pink and purple!" "So. How was today and how is our first foster?" "Oh Antoine. She is so damaged!" "What do you mean, damaged?" 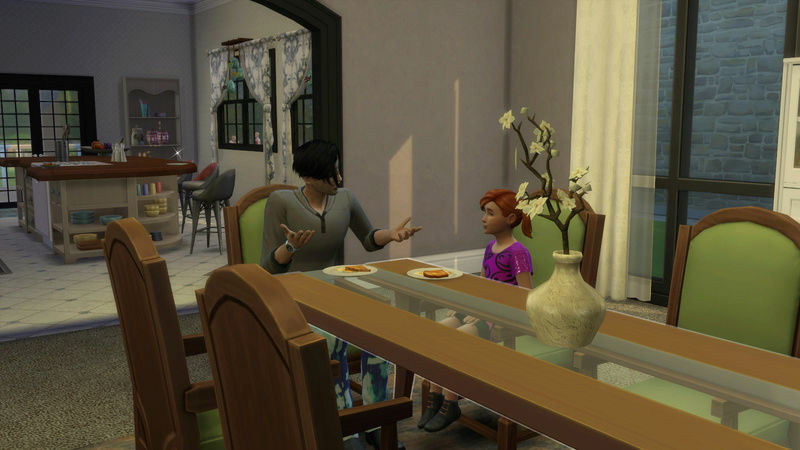 "Before she got here, Claudia, the lady from San Myshuno's Child Health and Welfare division, told me that Ruby was removed from her home due to unhealthy living conditions. I don't know if she feels abandoned by her parents or what is going on in her little mind but it breaks my heart!" "Oh Aili. She's been put in the right home then. With a person like you to take care of them, Ruby and any of the other children we have come in will be lucky to have you as a foster mom. I'll get up early tomorrow and hopefully catch Ruby at breakfast." "I think she may like that." "Okay. Time for bed. You coming?" "Yeah. I'm a little wore out." "Good morning little lady. You must be the famous Ruby that Aili told me all about." "She also told me about your one word answers." "Ruby. You can trust us. We aren't going to hurt you or let anything bad happen to you." "Who says something bad happened to me? No one hurt me, mister." "Okay. Ruby lets get one thing straight. You will not speak to me or Aili like that ever again. We are here and are allowing you to stay with us as our foster child." "And if I don't abide by your rules you'll call Claudia, like all the others and have me taken away. Big deal. Call her. I just want my mom and dad. You are not my mom and dad!" "Ruby. No I'm not your parents but you can not go back there. It's not that they don't want you it's because...has anyone told you why you can't live with them anymore?" "What the...You know what Ruby. I'll make you a deal or promise." "I promise that after you get done with school and I get done at work, we will sit down and have a long discussion about why you can not live with your parents anymore. Okay?" "Great. Finish your breakfast and off to school." They have taken on a challenge. Good luck to them all. Thanks MW! I think with Ruby they will need it too. She has the Insane trait It will be interesting to see how well she gets along with the others who join the house. "Hello, yes I'm trying to reach Aili Morrissey or Antoine Dukes, please?" "This is Aili, how may I help you?" 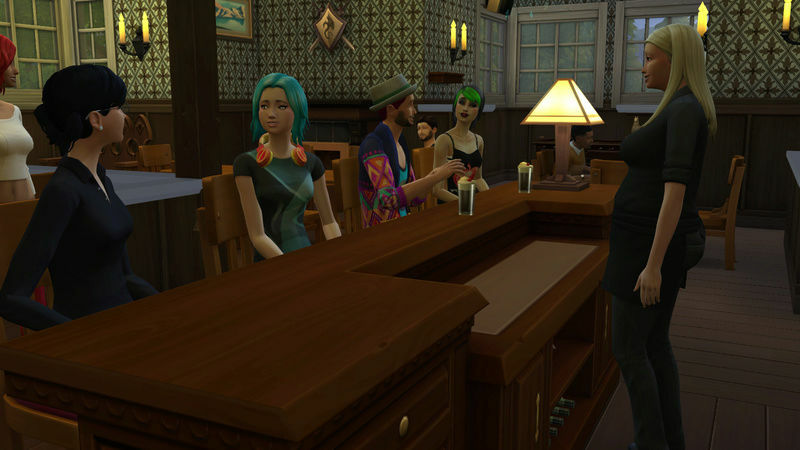 "Hello, Miss Morrissey, my name is Mr. Morganstein with Willow Creek Child Social Services. Chief Ranold gave me your number. I understand that you and your fiance have opened up your home to orphaned children?" "Are you the same Aili Morrissey and Antoine Dukes who ran away from the orphanage?" "Um...yeees we are." "Will that be a problem with us being foster parents? I...we understand that our not being married is not an issue as we have one child given to us already." "No. No Miss Morrissey neither of those serve as a problem with you two being foster parents. I was just wondering, is all. In fact if you ask my personal opinion, both of you are perfect to be foster parents because of the living conditions you had living in the old orphanage. Placing children with you will not be any problem with me." "Good to know, Mr. Morganstein. Now is that all you called about?" "Oh no. I called to see if you could take on 3 more children?" "Three? At the same time?" "Well...yes. If that would be a problem, we can always find homes for them." "No, no. It's just that I wasn't expecting to get three children all at once. We are still so new at this. When can we expect them?" "They will be arriving tomorrow afternoon. I will be dropping them off myself. There is one girl and 2 boys. Brylee Hager, Mathias Steiner and Pawel Kinsey. They are last remaining children from the original orphanage." "But I thought that was shut down years ago?" "It's taken us sometime to close it down. There were a lot of toddlers there that we didn't know if they were actual orphans or if they were stolen." "We were able to reunite many with their birth parents, but not for these three. They've been through a lot, Miss Morrissey." "Aili, please. Yes. I imagine they have...I guess I better go shopping for furniture today." "Well tomorrow then. Have a good day, Miss....Aili." "Hello and welcome to Prominade Furniture Outlet. I'm David and will be here to assist your furniture shopping should you need any assistance." "Hi David. I'm looking to make a pretty big purchase." "Excellent Miss Morrissey. And may I ask what type of furniture are you looking to purchase?" "I need a mattress for a top bunk, sheets and blankets for a girl. Also two beds, preferably matching in frame also with sheets and blankets for boys. Oh and also matching dressers." "My that is a tall order, but we here at Prominade Furniture Outlet strive to make our customers happy and satisfied. If we do not have what you are looking for we will order for you and send it to your home, free shipping." "Well that's very nice to hear as I will probably be coming back for more in the future." "Oh? If you don't mind me asking, what is all the children's furniture for? You don't look old enough to have that many children, Miss." "No they aren't my children, per say. My fiance and I..."
"Oh wait! You are the young couple who ran away from the old orphanage!" 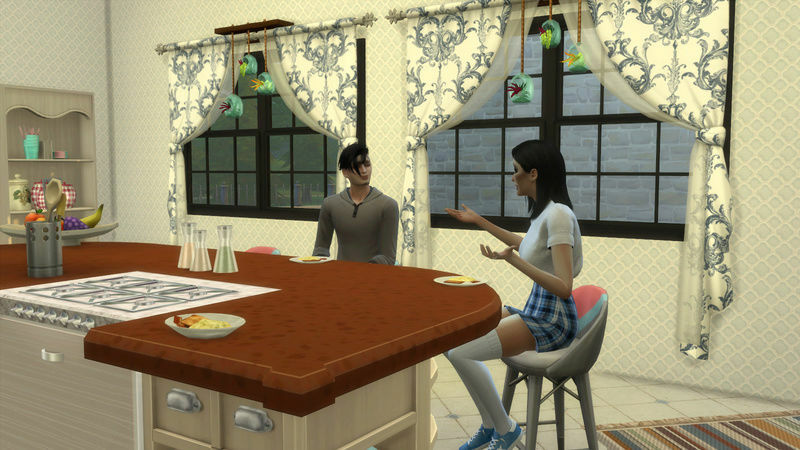 "And you two have opened up your home in NewCrest to be a foster home. I remember hearing people all over whispering about how you two were so brave to run away from that horrible old woman and we all cheered for you two. Such brave young souls. And now you're giving back to the communities." "Miss Morrissey, whenever you need anything, you just give us a call and we will deliver to you anything you need. And please, as a token of appreciation for opening up your home to those poor children, who by the way could not ask for better foster parents, all purchases from today and forward will tax free and at a reduced price of 40%." "I...I don't know what to say. You don't have to do that. We can pay..."
"Nonsense. We wouldn't want to have it any other way." "Well thank you. Thank you very much." "Excuse me. But I couldn't help but overhear your conversation. My name is Bjorn Bjergsen." "Hello Mr. Bjergsen. I'm Aili. Aili Morrissey." "Miss Morrissey, I'd like to start a foundation in honor of you and your young man. It will help in giving aide to your home and expenses." "Oh thank you Mr. Bjergsen. But Antoine's father and grandfather are already taking care of that." "Well, think it over and remember, in the event anything should happen to you, Mr. Dukes, his father or grandfather...these children still need support." "I will think about it and talk to Antoine and his father and grandfather." "Very well. Here is my number. Call anytime, Aili. My wife Clara offers her support as well." "Thank you. Thank you again Mr. Bjergsen." "Ugh do you have to squeeze so hard?" "But I want you to feel comfortable here, Ruby. This is your home now." "Also I have a bit of news." "We, you, um...there are 3 more children coming tomorrow." "Great. Just great. Can I go do my homework?" "Yeah. Sure. Antoine should be home soon." "So Ruby. How about we have that talk like I said we would?" "Nah. I don't want too." "Okay then, do you need help with your homework?" "Would you like a bedtime story before bed?" "Ruby is there anything we can do for you to make you understand we are not going anywhere and neither are you." "That's what the last 3 foster parents said and what my mum said. Then she died." "We're sorry to hear that Ruby. But we aren't going anywhere." "Did you know that Aili and I were once orphans ourselves?" "Yeah. We were. We were both taken from our parents by a not so nice person. So we know or kinda know what you're feeling." "You were in foster homes too?" "No not exactly. We were raised in an orphanage." "It is a huge home with not too many bedrooms. None of us had our own rooms. We didn't have toys and we had to share our clothes. Sometimes we were forced to wear clothing either to big or too small for us. There were a lot of us children there and we were only allowed into our bedrooms, bathroom and library. We weren't allowed in the kitchen or watch TV or play outside." "I'm telling you this Ruby because we, Aili and I know what it's like to grow up like that and we want to make sure you don't." 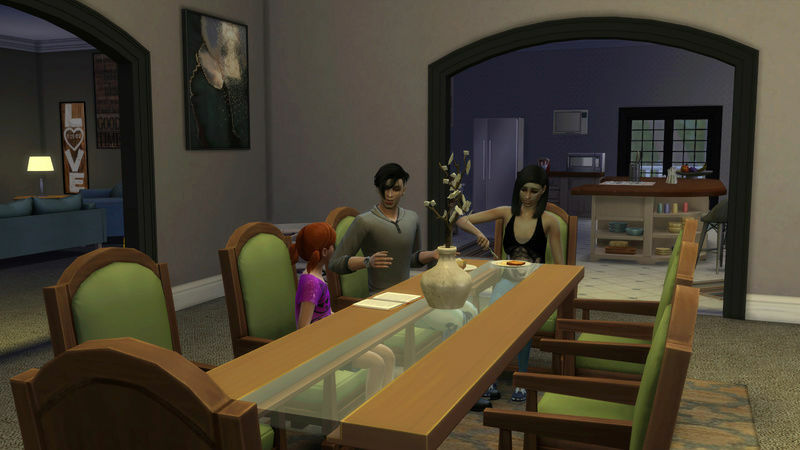 "I didn't get the chance to tell you yesterday, but we have 3 more children coming from Willow Creek today." "Oh? Does dad or granddad know?" "Didn't think I had to run it by them, Antoine." "Well no you don't. But what about furniture?" "About that too. I went to Prominade Furniture Outlet and long story short, they are giving us 40% off our entire purchases from here on out and they will deliver. All I have to do is call them and tell them what I'm looking for." "Yeah. I also met a Mr. Bjergsen. He wants to start a foundation in honor of us and for the children. I told him your dad and granddad are already handling any financial needs we may have." "I'll run it by dad or granddad later. Right now I have to go to work." "Okay have a good day, Ani, love you." "Love you too, Al. When did you say those other ones will be here?" "Later today. Their furniture will be delivered this morning." "Oh ok. I'll leave everything in your capable hands." Great story so far! I look forward to seeing how this "family" grows. Wonderful news. They seem to very appreciated by their neighbours.